As the colder days draw in I’ve been trying to up my game with the skin care regime. I can be slightly prone to getting spots and spotted this exfoliator in the local supermarket for £2.30. So what the hell I thought and shoved it in with my normal weekly shop. I love it so much I’m sharing it with you guys. It’s a daily exfoliating scrub which promises to unclog pores, targets spots and blackheads and reduces the appearances of marks, specially made for oily spot prone skin. The formula contains 2% salicylic acid with antibacterial agents to aid unclogging of pores and natural plant sources derived from blueberries to soothe the skin. I’m always a little bit sceptical about daily exfoliators one because they can be quite harsh to the skin and two it can tend to make my skin so dry and irritable. But this one does neither. The formula is blue, with tiny micro beads within and you can tell just by feeling it that it’s not going to feel overly aggressive on the skin and it smells so fresh (I wish there was a smellygram on here). Once applied to the face and neck area you can feel a slight tingling on the skin so you can really feel it working. I love products that make your skin tingle ! It also feels really gentle on the skin and doesn’t have that scrapy feel that you get with other exfoliators. So a week into using this product and I’m feeling a huge difference with my skin tone and texture. My spots have seemingly disappeared, my skin feels supple and smooth and I have acquired a lovely looking glow. 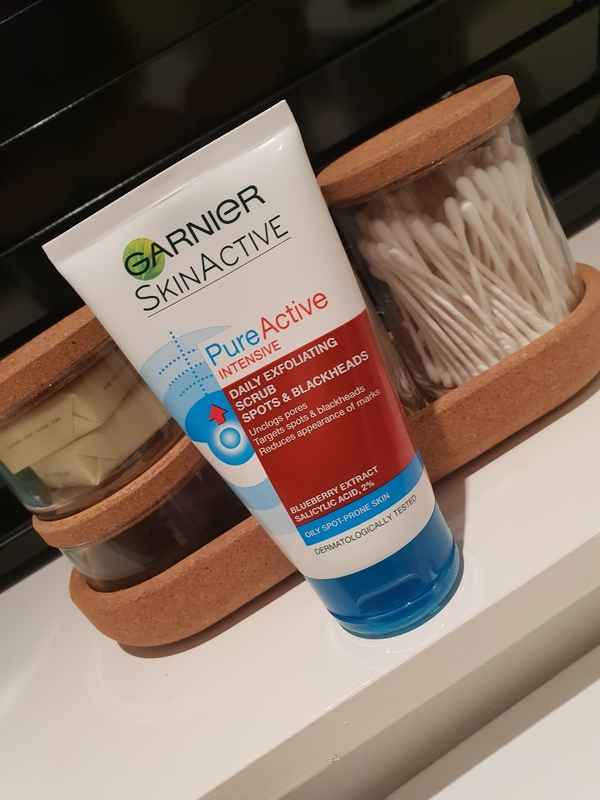 I have started using some other moisturisers from the brand ordinary round about the same time but definately think this scrub has worked in conjunction with those products and my skin has never felt better. I will be buying this again ! Great product !! Thankyou for reading . Hope you liked reading this blog . Please follow me and subscribe to emails .